Naperville, IL, November 8, 2008 – Barbara Brabec’s latest ebook, Secrets to Maximizing Schedule C Deductions: Proven Strategies for Cutting SE Taxes to the Bone, offers a crash course in how to save a bundle on taxes and become a more educated and savvy taxpayer. “If you operate a business from home and file a Schedule C form, there are many things you can do right now to lower the amount of self-employment, federal and state taxes you will have to pay on this year’s business profits,” says Barbara Brabec, author of Homemade Money and seven other books for home-business owners. 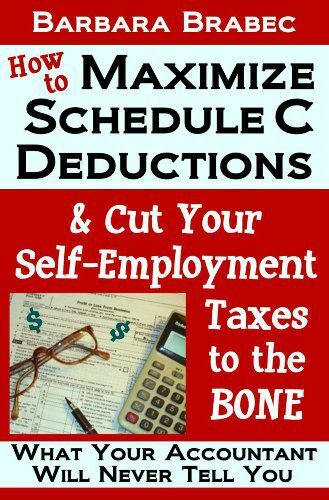 Her new ebook, Secrets to Maximizing Schedule C Deductions, includes the proven strategies she has used for more than thirty-five years to cut her self-employment taxes to the bone. The topic of taxes is considered boring by many, but saving money isn’t a boring topic, and this book isn’t boring, either. “It’s humorous, entertaining and chock full of tax tips and information to help you improve your bottom line,” says Bill Ronay, Events2000.com. It’s also a crash course in how to save a bundle on self-employment taxes and become a more educated and savvy taxpayer. 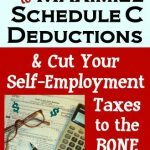 Included in Secrets to Maximizing Schedule C Deductions is a checklist of 65 Schedule C deductions (with discussions on most of them), plus detailed information on eleven categories of indirect and direct expenses related to the Home Office Deduction (one so many business owners are reluctant to take for fear of an IRS audit). But this is not what’s likely to trigger an audit, says Brabec. Emphasis is also given to the tax benefits of hiring a spouse or child to help with the business, as well as to the tax dangers of hiring independent contractors (especially to craft businesses who may be using homeworkers to produce goods for sale). More tax-safe options for hiring outside help are suggested in this chapter. Tucked here and there throughout this helpful book are two dozen special tips on such things as why you should think twice before making your spouse a partner in your business instead of an employee; why married women who use a different name for their business may be losing Social Security credits by filing a joint return with their husband; and why selecting the wrong auto expense method in the beginning can be a costly mistake. Closing the book is a Resource Chapter that includes links to tax-related websites and articles, each offering additional information on specific tax deductions or strategies discussed in the book. While you’re there, be sure to check all the craft and business articles she’s written over the years and the biographies, memoirs, and “life living” books, too! Help for your 2009 Schedule C Tax Preparation! 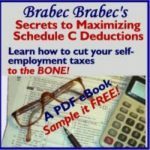 Barbara Brabec’s Schedule C Tax eBook! Advertise Your Business on Your Checks with Photos!